Make this the first night as a main dish. Use it as a side dish the second night or carry it in your lunch box. 1) In large saucepan on medium-high heat, add olive oil, chopped onion and sliced leek. Saute until vegetables are tender (5-10 minutes). 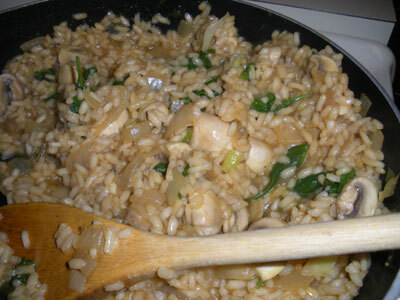 2) Add rice and sauté for a couple of minutes. 3) Reduce heat to medium. Add one cup of the vegetable broth and stir until absorbed by the rice. 4) Add the second cup of the vegetable broth and stir until absorbed. 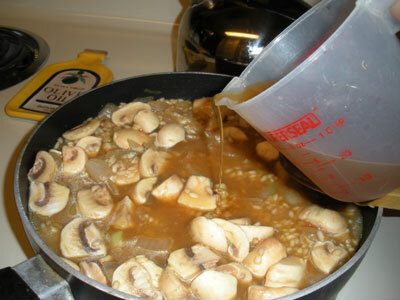 5) Add the sliced mushrooms and stir. Then add the final third cup of broth. Stir until absorbed. 6) Add the baby spinach salt & pepper and stir until spinach wilts. Ready for serving. Makes three large servings or six side servings.